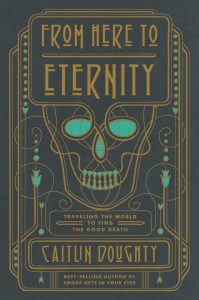 I saw it as a nominee for the Goodreads Choice Awards best nonfiction book of 2017 and it seemed interesting– I read both Mary Roach’s Spook and Stiff a few years ago and found the topic of how we as a culture think about death and the afterlife really interesting then, too. This book talks more about cultural practices and beliefs about death and bodies and is a light and engaging read (for real!). They highlighted a natural burial ground in North Carolina! I thought that was pretty cool. Anyone interested in learning more about the topic of burial itself, but in a “morbid lite” kind of way. Also anyone interested in diverse cultural practices and beliefs– the book looks at countries from around the world (hence the travelogue part of the genre description). 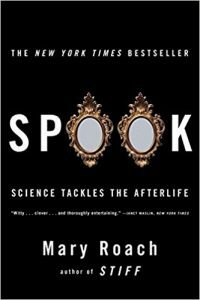 Spook: Science Tackles the Afterlife by Mary Roach is available at the Main Campus Library in the downstairs stacks (call number BL 535 .R63 2006). 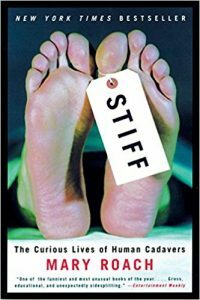 Stiff: The Curious Lives of Human Cadavers by Mary Roach is available at the Orange County Campus Library on the New Books shelf (call number R 853 .H8 R635 2004). Take home a stack of books to keep you company over the holidays!